This user-friendly guide to effective writing for the justice system teaches readers to write cogently and accurately across the spectrum of criminal justice-related disciplines. With an examination of common writing problems that interfere with good reporting and documentation, it underscores the importance of skilled written communication as a cornerstone of competent practice within criminology. It provides examples of strong writing that demonstrate communication of cultural competency and help students develop critical thinking/writing skills. Of outstanding value are numerous examples of real-world writing alongside discussion questions and explanations, enabling students to think critically and truly understand what constitutes good writing. Actual forms and records used in practice are included along with real-world writing examples drawn from all areas of practice: police, corrections, probation and parole services, social work, miscellaneous court documents, and victim advocate services. 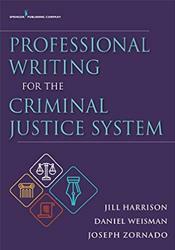 The book's interactive approach to writing includes forms on which students can practice their skills, practice tests, and chapters organized around the standard curriculum taught in most criminal justice programs.